“Abu Luqmaan Almani” is a Twitter personality and propagandist for ISIS, most likely operating out of ISIS-controlled territory. 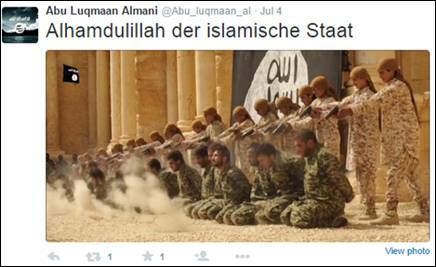 Almani tweets almost entirely in German,Abu Luqmaan Almani, Twitter post, June 30, 2015, 8:10 a.m., https://twitter.com/Abu_luqmaan_al/status/615900342996348929. but will retweet content in English and Arabic.Abu Luqmaan Almani, Twitter, accessed July 15, 2015, https://twitter.com/abu_luqmaan_al. A Twitter account with the username “Erasmus Monitor” whose bio reads: “Monitoring German jihadis, their networks and finances; researching in Security Sector Reform”Erasmus Monitor, Twitter, accessed July 16, 2015, https://twitter.com/Erasmus_Monitor. has engaged in Twitter conversations with Almani. 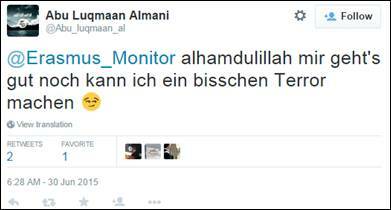 On June 29, 2015, Erasmus Monitor tweeted that Luqmaan al-Almani, allegedly from Düsseldorf, was reported dead. Almani replied “Alhamdulillah [thanks be to God] I’m fine, I can still make a bit of terror.”Abu Luqmaan Almani, Twitter post, June 30, 2015, 10:11 p.m., https://twitter.com/Abu_luqmaan_al/status/617923780304891904. Almani posts images of jihadists displaying the ISIS flagAbu Luqmaan Almani, Twitter post, July 1, 2015, 7:51 p.m., https://twitter.com/Abu_luqmaan_al/status/616439135167991808. and weaponry.Abu Luqmaan Almani, Twitter post, July 1, 2015, 2:45 p.m., https://twitter.com/Abu_luqmaan_al/status/616362016178110464. 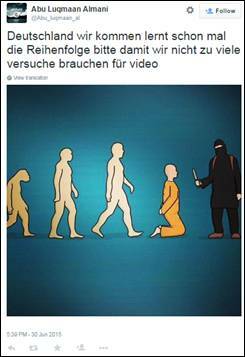 He tweets images that normalize violence, such as in June 2015 when he posted the following cartoon:Abu Luqmaan Almani, Twitter post, June 30, 2015, 5:39 p.m., https://twitter.com/Abu_luqmaan_al/status/616043397644746752. Almani boasts his allegiance to ISIS, and frequently tweets photos of the terror group’s flag with laudatory comments, such as “Alhamdulillah [thanks be to God] the Islamic state.”Abu Luqmaan Almani, Twitter post, June 1, 2015, 4:11 p.m., https://twitter.com/Abu_luqmaan_al/status/616383696606756864. 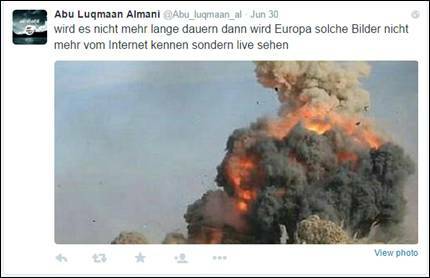 His first tweet included a photo of an explosion, with the text: “it is not much longer until Europe will no more know such pictures on the internet, rather see them live”:Abu Luqmaan Almani, Twitter post, June 30, 2015, 8:10 a.m., https://twitter.com/Abu_luqmaan_al/status/615900342996348929. 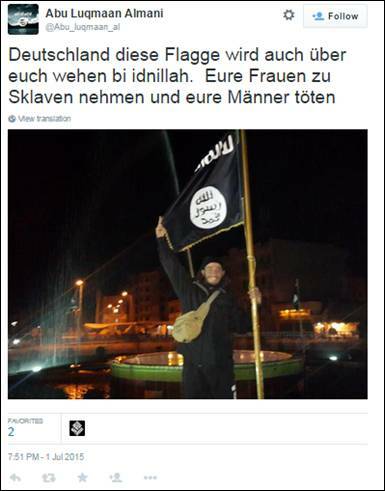 Almani has tweeted photos of the ISIS flag with messages directed at Germany, writing, “Germany, these flags will fly above you, bi idnillah (God willing). Your women taken as slaves and your men killed.”Abu Luqmaan Almani, Twitter post, July 1, 2015, 7:51 p.m., https://twitter.com/Abu_luqmaan_al/status/616439135167991808. Translation: “Germany, these flags will fly above you, bi idnillah (God willing). Your women taken as slaves and your men killed.”Abu Luqmaan Almani, Twitter post, July 1, 2015, 7:51 p.m., https://twitter.com/Abu_luqmaan_al/status/616439135167991808. 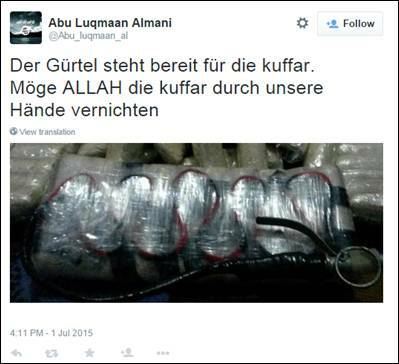 In July 2015, Almani tweeted a photo of a belt laced with explosives. In the caption, he wrote “the belt is ready for the kuffar (nonbelievers). May ALLAH annihilate the kuffar through our hands.”Abu Luqmaan Almani, Twitter post, June 1, 2015, 4:11 p.m., https://twitter.com/Abu_luqmaan_al/status/616383696606756864. Translation: “The belt is ready for the kuffar (nonbelievers). May ALLAH annihilate the kuffar through our hands”Abu Luqmaan Almani, Twitter post, June 1, 2015, 4:11 p.m., https://twitter.com/Abu_luqmaan_al/status/616383696606756864. 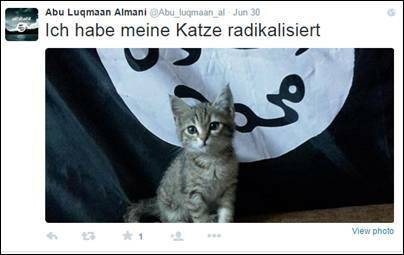 In what may be an attempt to normalize allegiance with ISIS, Almani posts pictures of kittens in front of the ISIS flag accompanied by amusing tweets such as, “I’ve radicalized my cat.”Abu Luqmaan Almani, Twitter post, June 30, 2015, 8:51 a.m., https://twitter.com/Abu_luqmaan_al/status/615910550644596736. @Abu_luqmaan_alAbu Luqmaan Almani, Twitter, accessed July 15, 2015, https://twitter.com/abu_luqmaan_al. “So I remind you of the words of Allah. He will kill you wherever he finds you. Kill yourselves with a screwdriver. Surat tauba 9:29”Abu Luqmaan Almani, Twitter post, July 5, 2015, 10:11 p.m., https://twitter.com/Abu_luqmaan_al/status/617923780304891904. 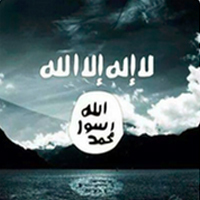 “Alhamdulillah [thanks be to God] the Islamic state”Abu Luqmaan Almani, Twitter post, July 4, 2015, 10:11 p.m., https://twitter.com/Abu_luqmaan_al/status/617467134260682752. “The belt is ready for the kuffar (nonbelievers). May ALLAH annihilate the kuffar through our hands.”Abu Luqmaan Almani, Twitter post, July 1, 2015, 4:11 p.m., https://twitter.com/Abu_luqmaan_al/status/616383696606756864. “Germany, these flags will fly above you, bi idnillah (God-willing). Your women taken as slaves and your men killed.”Abu Luqmaan Almani, Twitter post, July 1, 2015, 7:51 p.m., https://twitter.com/Abu_luqmaan_al/status/616439135167991808. “I've radicalized my cat”Abu Luqmaan Almani, Twitter post, June 30, 2015, 8:51 a.m., https://twitter.com/Abu_luqmaan_al/status/615910550644596736. “Alhamdulillah [thanks be to God] I’m fine, I can still make a bit of terror”Abu Luqmaan Almani, Twitter post, June 30, 2015, 10:11 p.m., https://twitter.com/Abu_luqmaan_al/status/617923780304891904.